Do sounds from the rear inspire a tear? Never fear, Otohime is here! Toilet noises can be embarrassing, but what's a shy girl to do besides repeatedly flushing in situ? 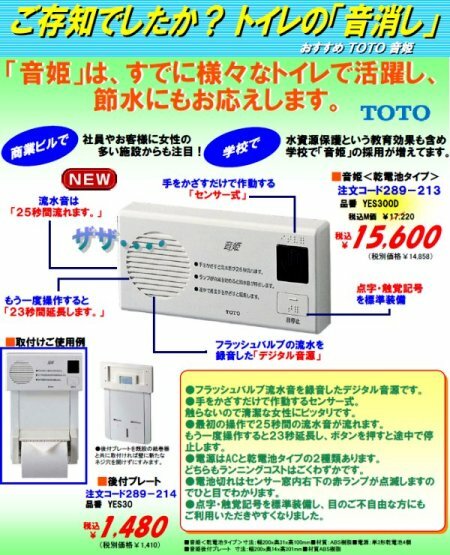 Japan's answer is the Otohime (pronounced "oto-hee-may"), also known as the "Sound Princess" - an electronic "flush" that saves face as well as water. Japanese women can be exceedingly modest when it comes to the characteristic sounds of nature's call, regardless of the fact that they are either alone in their home's bathroom or among their own kind in a more public washroom setting. With the advent of western-style flush toilets in the post-war era, modest misses found that merrily flushing away effectively masked any embarrassing noises. Unfortunately, by the 1980s legions of ladies managing their modesty led to a virtual Niagara of wasted water - a fact not lost on Japan's governing authorities. If there's anything Japanese industry knows, it's toilets and electronics. The collective brain trust at toilet manufacturers like Toto came up with a remarkably simple fix for the flagrant flushing: the Otohime. 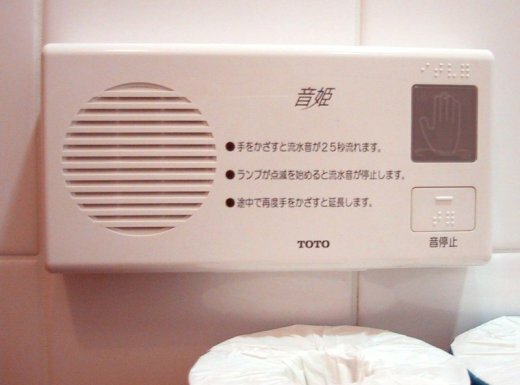 It works like this - a wave of one's delicate feminine hand (men have no need of such a device) across the front-mounted sensor activates the sound of a typical toilet flush; rendered in Japanese as "Zaa-Zaa". The sound plays for about 25 seconds and can be stopped by pushing the button just below the sensor. Problem solved, modesty preserved, and precious water saved! As Seen On TV: Is the EZ Cracker All It's Cracked Up To Be? I want one for our guest bathroom. It's near the kitchen where everyone hangs out. My apartment's fan sounds like a 747, so this isn't necessary. I'd rather have it, though, assuming that it's quieter than a 747.